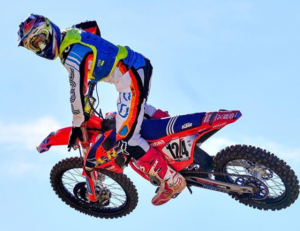 At ACTIONETIX, when we design training, nutrition and programs for athletes in the sports of Motocross, Snocross, Enduro, Trials etc., we not only focus on training the body’s energy systems, strength output and endurance markers, we also focus in intensely on a concept we call Power to Weight Ratio or PTWR. In our eyes PTWR is one of the most important aspects of competitive racing (or even recreational racing) – the weight of the rider and machine combined vs. the horsepower the machine delivers. This concept also applies to athletes on mountain and road bikes as well. A well aligned PTWR is an advantage to almost any rider that that depends on a motor. Just look at Formula 1 for example. They spend countless hours and time working on ways to shave ounces of the car’s weight without giving up strength of the vehicle or dependability on the track. The lighter the car is vs. the horsepower, the faster it can accelerate and, in many cases, reach a higher top speed. Motocross is not much different. Top factory race teams spend countless hours making the bikes lighter, and the motors more powerful. Using lighter seat compounds, titanium bolts, grinding down excess material on welds, switching to machined aluminum foot pegs are just some of the ways these teams decrease the bike weight. Conversely, changing motor compression, the ability for the bike “breath” more air as well as things like jetting and mapped fuel injection can all contribute to maximum horsepower. This changes the bike’s PTWR. But what about the rider? How does the rider’s weight play in to an optimal PTWR? At ACTIONETIX we believe the most efficient way to improve the PTWR is to ensure the rider is at an optimal weight for the bike’s horsepower rating. If the rider is at the correct weight, with optimal strength and endurance vs. the horsepower of the bike, then the ability of the two to work together is optimized. Let’s look at a simple comparison of the 125cc bike. Most of these stock bikes produce around 30 horsepower out of the box. If two different riders throw their leg over the exact same bike, and one rider weighs 120 pounds and the other weighs 170 pounds, they will have two completely different PTWRs. The first rider will be a ratio of 30 HP : 120 pounds or 1 : 4 PTWR. The second rider will be a ratio of 30 HP : 170 pounds or 1 : 5.67 PTWR. So, by the calculations above, the rider with the higher PTWR (lighter rider) in theory has a better chance of accelerating faster in holeshots, out of corners and in straightaways. As we always say, “This is simple physics.” This simple concept of PTWR dictates much of the direction for us when we design nutrition and strength programs. Adjust the rider’s body weight so they can optimize their PTWR and in parallel improve their strength output and cardiovascular ability all at the same time. How do I Improve my Power to Weight Ratio? Assess total caloric intake – Riders whose weight is over the optimal PTWR may be prescribes caloric intake as low as 17 calories per pound of target body weight. Conversely riders whose weight is under the optimal PTWR may be prescribed as much as 23 calories per pound of target body weight – everyone gets prescribed caloric intake based on their individual needs. Customize the ratio or macronutrients – We break down the specific needs of protein, carbohydrates and fats for each rider. While the human body has many subtle differences from person to person, in general we process foods the same way (unless you have a metabolic condition like diabetes). The difference is in the efficiencies of how each person processes food and utilizes calories.One person may process carbohydrates very well, where another person may be more sensitive to carbohydrates and they are more likely to produce fat storage. These are the finer details of working with an athlete for six (6) months or more that can be manipulated for exception athletic performance. Optimize the training plan for the individual – Yes, we all know that aerobic (cardiovascular fitness) is very important for motorsports, however our belief is that strength training is equally important. When it comes to optimizing PTWR we customize the ratio of aerobic vs. strength training for each athlete until optimal PTWR ratio is achieved. If an athlete is under weight, we focus more on strength training to build lean, functional muscle that can help control the bike. This is complemented with aerobic training. If the athlete is overweight, we focus more on aerobic training which is complimented with a lower volume of strength training. In both cases, aerobic and strength training is performed, however the ratios and focus is changed for each individual rider depending on their needs. Create a custom supplement plan to accelerate results – Utilizing the correct supplements like HemoAde can be the difference between success and failure. Many common supplements are unfortunately designed for bodybuilding and can have negative effects on racing. Creatine and caffeine are perfect examples of two ingredients that many racers may want to avoid. There is much more to this topic, however supplements can play a key roll in overall performance and achieving the best PTWR. To summarize, at ACTIONETIX, we believe that the success and enjoyment of any athlete – professional or recreational starts with optimal health and a Power to Weight Ratio that can maximize performance. Each individual will react differently to training and nutrition in order to achieve their best PTWR, but with desire and some focus on nutrition, training and supplementation a dramatic improvement in overall performance can be achieved.